Play paintball in Sydney for the ultimate experience! There are so many things to see and do in Sydney, but if you are looking for an outdoors thrill that will test your bravery, wits and determination, then choose one of the AUPBA-approved paintball centres that surround the city. Paintball is an experience you will never forget, and Sydney offers some of the best paintballing in Australia. With a combination of indoor and outdoor paintball arenas, the Harbour City has a range of world-class paintball facilities that are ready and waiting for you and your fellow comrades. Attempt to outwit and outplay the opposition using everything you’ve learnt from the movies to strategise a plan of attack. Usually, the fastest and most energetic players will lead from the front and get into a position that will allow the rest of the team to advance. If you are not physically fit or just don’t fancy being too gung-ho, then you can hang back, sneak around and use sniper shots to pick off each of your opponents one by one. The beauty of the sport is that there is a way to play that suits everyone! There are a range of paintball centres that surround Sydney, from exciting indoor paintball action to the more preferred rugged outdoor paintballing. If outdoor paintball is your preferred choice then the AUPBA highly recommends playing at either Delta Force Appin or Heartbreak Ridge. Both of these centres will get the blood pumping as you take to the very impressive paintball fields. The centres have excellent themed paintball scenarios, but the newly opened Delta Force Paintball centre in Appin has received the highest rating from the AUPBA for their great facilities and incredible movie-set game zones. 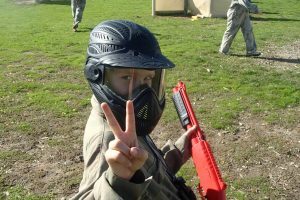 Complete with the latest equipment, including full head helmets and custom-made body armour (paintball vest), and action-packed game zones, Delta Force Appin provides the most enjoyable and comfortable paintball adventure in Sydney. Attempt to capture the ancient idol from the giant pyramid, defeat the terrorists who are holding hostages on the London double-decker bus, and regain control of the prison from the dangerous inmates. You will experience all this plus more on your day out at Appin. So whether you are a weekend warrior or an average Joe, start prepping the entourage for what will be a truly memorable day. 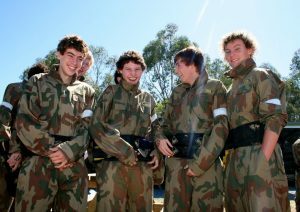 Click here to locate your nearest paintball centre and experience the best paintballing Sydney has to offer.